At our PRAS meeting in January, Tony Licata will be presenting the results of our Annual Christmas Bird Count. 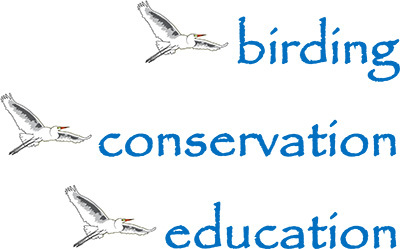 Below, you can read the letter (email) that was sent to all of the bird count participants. Thank you all for helping on the 2016 Christmas Bird Count on December 17th. Even though we had sunny and mild weather, our total count was DOWN by 9% to 21,266 versus 23,272 in 2015; 24,172 in 2014; 27,192 in 2013; 23,975 in 2012; 17,718 in 2011; 22,272 in 2010; 19,082 in 2009; 24,516 in 2008. The decline in numbers in 2016 was due to seeing only 1710 Lesser Scaup compared to 4632 in 2015, and by seeing only 1822 Tree Swallows compared to 4087 in 2015. The 172% increase in Turkey Vultures was due to the red tide fish kill. On count day we saw 140 species, a increase of 5% versus 133 in 2015; 125 in 2014; 143 in 2013; 131 in 2012; 130 in 2011; 118 in 2010. For count week we saw 145 species, which is a record number, an increase of 7% versus 133 in 2015; 140 in 2014; 143 in 2013; 135 in 2012; 131 in 2011; 123 in 2010. Over fifty participants spent over 300 hours in search of birds by foot, car, cart, or boat, and covered over 500 miles by land or sea. Of note, we recorded on count day for the first time ever Whip-poor-will (Airport Ponds), American Woodcock (Airport Ponds), and Northern Parula (Babcock Cecil Webb). Others which we have not recorded in quite a while was the Sedge Wren, which we last saw in 2008.
,Of the birds we did see, there were at least 60% declines in Painted Bunting, Short-billed Dowitcher, Reddish Egret, Herring Gull, Red-tailed Hawk, Ruby-crowned Kinglet, Snail Kite, Burrowing Owl, Semipalmated Plover, Least Sandpiper, Yellow-bellied Sapsucker, Lesser Scaup, Black Skimmer, Bachman’s Sparrow, Forester’s Tern, Hermit Thrush, Ruddy Turnstone, and Black-and-white Warbler. Counts were up at least 200% for Eastern Bluebird, Indigo Bunting, Fish Crow, Long-billed Dowitcher, Mallard Duck, Cattle Egret, House Finch, laughing Gull, Ring-billed Gull, Cooper’s Hawk, Yellow-crowned Night-Heron, Wilson’s Snipe, Roseate Spoonbill, Eastern Towhee, White-eye- Vireo, Yellow-throated Warbler, Downy Woodpecker, Pileated Woodpecker, House Wren, Greater Yellowlegs and Lesser Yellowlegs. There can be wide fluctuations in counts from one year to the next as with Indigo Buntings, Ring-billed Gulls, Cooper’s Hawk, Yellow-crowned Night-Heron, Eastern Towhee, Downy Woodpecker, Pileated Woodpecker and House Wren declined more than 60% in 2015, but rose more than 200% in 2016. The opposite held true for Least Sandpiper which increased more than 200% in 2015, but declined more than 60% in 2016. Boat-tailed Grackle 770. 10. Turkey Vulture 442. Boat-tailed Grackle was added to the top ten while Least Sandpiper was deleted, otherwise all the other species just changed their rankings. The following 20 birds had higher totals than in any of the last 17 years: Indigo Bunting, Long-billed Dowitcher, House Finch, Purple Gallinule, Ruby-throated Hummingbird, Glossy Ibis, White Ibis, Limpkin, Ovenbird, Northern Parula, Eastern Phoebe, Greater Scaup, Loggerhead Shrike, White-eyed Vireo,Turkey Vulture, Whip-poor-will, American Wigeon, American Woodcock, Sedge Wren and Greater Yellowlegs. There were 9 birds that we did not record through count week in 2016 but did in 2015: Bufflehead, Reddish Egret, Broad-winged Hawk, Ruby-crowned Kinglet, Burrowing Owl (this is the first time we have not seen one), Black Skimmer (this is the first time we have not seen one), Bachman’s Sparrow, Hermit Thrush, and Cedar Waxwing. There were 15 birds that are seen occasionally which we did not record through count week in the last two years: Mallard-Mottled Hybrid Duck, Ruddy Duck, Least Flycatcher, Gadwall, American Oystercatcher, American Pipit, Clapper Rail, Redhead, Western Sandpiper, Sora, Chirping Sparrow, Northern Rough-winged Swallow, Wild Turkey, Hairy Woodpecker and Marsh Wren.. If you are interested, I can send you the 17 year comparison. I’ll be giving my Christmas Bird Count presentation at the PRAS meeting on Thursday, January 19th. at 6:30 PM at the First Alliance Church 20444 Midway Blvd. Port Charlotte. Again, thank you all for helping on the count this year.